Building on its eight-decade reputation of fish-catching success, Luhr-Jensen® is introducing five new eye-catching chrome color patterns in both its Kwikfish® K and X series baits: Silver, Green Chrome Red Streak, Black Chrome Red Streak, Blue Chrome Pink Streak and Red Chrome Pink Streak. The new color designs are available in two models, the 9X Non-Rattle and the K11X Non-Rattle. The former dives as deep as 10 feet, measures 2 3/4 inches and comes armed with two No. 6 Extra-Strong Round-Bend VMC® Treble Hooks. The latter dives to 12 feet, measures 3 3/8 inches and sports two No. 4 Extra-Strong Round-Bend VMC Treble Hooks. These three models are available in all-silver for the first time: 14X Rattle, 15X Rattle and K16X Rattle. A fishing staple in the Northwest and Great Lakes for more than 80 years, Luhr-Jensen is synonymous in those regions with trout, kokanee, salmon, steelhead, bass and walleye fishing. 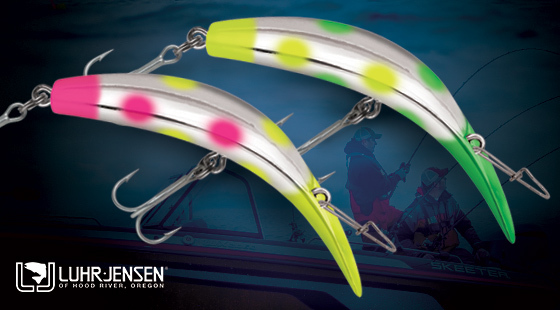 From trolling and casting spoons, to spinners and crankbaits, Luhr-Jensen fishing lures and accessories have defined angler success since 1932. Among the most successful and respected baits in that tradition is the Kwikfish, an excellent trolling and slow back-trolling plug for all medium to large gamefish. Featuring top-to-bottom molded construction and adjustable screw-in eyelets for custom tuning, Kwikfish in the K Series can be adjusted for slow or fast water conditions. Diving slightly deeper than the K Series baits, X Series Kwikfish boast side-to-side body construction, an internal rattle and a fixed eyelet that requires no tuning. The X Series baits swim with a wider, aggressive action — even in fast water. Additional features include stainless steel split rings, Extra-Strong Round-Bend VMC hooks and fixed eyelets, which eliminate the need for tuning. This entry was posted in Luhr Jensen. Bookmark the permalink.